Asia Regional Winner: The Umbrella Man by Siddhartha Gigoo (India). To meet Siddhartha Gigoo click here. Now an energy-rich sultanate, for centuries an important trading port in the South China Sea, Brunei has taken a different direction from its Persian Gulf peers. Immigration is restricted, and Brunei's hydrocarbon wealth is invested conservatively, mostly outside the country. Today home to some 393,000 inhabitants and comprising 5,765 square kilometres in area, Brunei first appears in the historical record at the end of the 10th century. After the Spanish attack of 1578, Brunei struggled to regain and expand its control on coastal West Borneo and to remain within the trading networks of the South China Sea. It later fell under British sway, and a residency was established in 1906, but it took the discovery of oil in Seria in 1929 before colonial power began to establish the base of a modern state. Governed by an absolute monarchy, Bruneians today nevertheless enjoy a high level of social protection and rule of law. Ranking second (after Singapore) in Southeast Asia in terms of standards of living, the sultanate is implementing an Islamic penal code for the first time in its history. Focusing on Brunei's political economy, history and geography, this book aims to understand the forces behind Brunei's to-and-fro of tradition and modernisation. Marie-Sybille de Vienne is a Professor at the National Institute for Oriental Languages and Civilisations, INALCO, Paris, Faculty of Southeast Asian Studies. 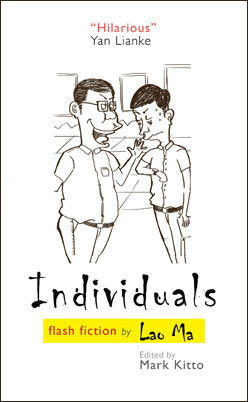 Individuals is a book of China-style flash fiction by master of short comic fiction and People’s University professor Lao Ma. As Vice Chancellor of China’s People’s University (Renmin Daxue), Professor Ma has championed several of China’s leading writers, including Yan Lianke, Zhang Yueran and Li Er. Lao Ma is known as the pioneer of the popular genre of flash fiction in China. Lao Ma has used his position to champion an approach to fiction seemingly opposed to that of many Chinese literary establishment figures, whose works can weigh in at 500,000 Chinese characters or more. Many professional Chinese writers are paid according to their literary output, measured by number of words. Western publishers have sometimes pointed to excessive length, and lack of proper editing, as a barrier to the translation of more Chinese literary works. Meanwhile, the average length of Lao Ma’s stories in Individuals is just 700 words. In his introduction, Lao Ma even dares to take aim at Nobel laureate Mo Yan, in the course of expounding his own philosophy of fiction: The 2012 Nobel literature laureate, Chinese writer Mo Yan, says a novel must be lengthy to qualify as an example of the art form. His major works usually weigh in at several hundred thousand words. According to Mo, “Any novel less than 200,000 words lacks dignity. A leopard might be fierce and brave but he is too short in stature to be the king of the jungle.” By his standards, Mo Yan is a tiger of a writer. Lao Ma contrasts Mo Yan’s approach with the short and concise stories of Argentine master Borges: I side with Borges. Length is not a measure of literary value. Dogs both big and small can bark. Legs long and short can run. Individuals lampoons frustrated professors, pompous judges and devious careerists, as Lao Ma skilfully dissects the hypocrisies and ironies of life in China. Translated by Li Qisheng and Li Ping. Edited by Mark Kitto (China Cuckoo). Forewords by the author, and by Yan Lianke. Published by Forty-Six Books, in paperback and eBook. Priced in local currencies. Asia Literary Review issue 27 is now available. For more information click here.